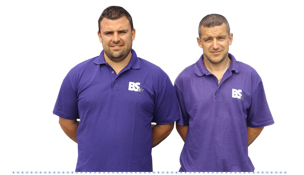 BS Air offers fantastic value on all installation and repairs, and, as a family-run company, we pride ourselves on the quality of our customer service. We have an extensive range of units available and we can provide you with as much information as you need to ensure you get the right unit for you. 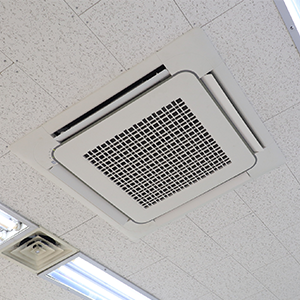 Ceiling mounted air conditioning units – best suited for open plan applications such as classrooms and offices, for an even distribution of airflow. This unit is also ideal where floor/wall space is limited. 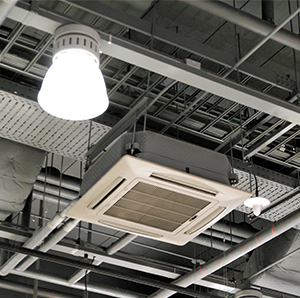 Ceiling cassette air conditioning is usually seen in one of two forms: ceiling cassette units or ceiling suspended units. Ceiling units benefit from a style that means the whole unit is not visible, just the section where the air itself is produced. Here at BS Air, we are proud to be a leading air conditioning installation company for the Truro, Bude and Cornwall regions. If you would like to know more about us, get in touch today and our friendly team will be more than happy to help you. Ceiling cassette units are installed into the ceiling void with only the 4 way fascia being visible, distributing an even coverage via the 4 grilles. It can be controlled by a wireless infrared remote control or a wired wall mounted control panel, and has the ability to both heat and cool a space. Ceiling suspended cassette units are the ideal solution for rooms, shops or offices without false ceilings. They are fixed to the existing ceiling and allow for airflow flexibility with air discharge in 4 directions. A multi-split system is when you have only one unit outside that controls numerous indoor units. These indoor units can then be independently controlled. This type of installation in perfect for when there is limited outside wall space, and, for when you want to independently control units in different rooms.